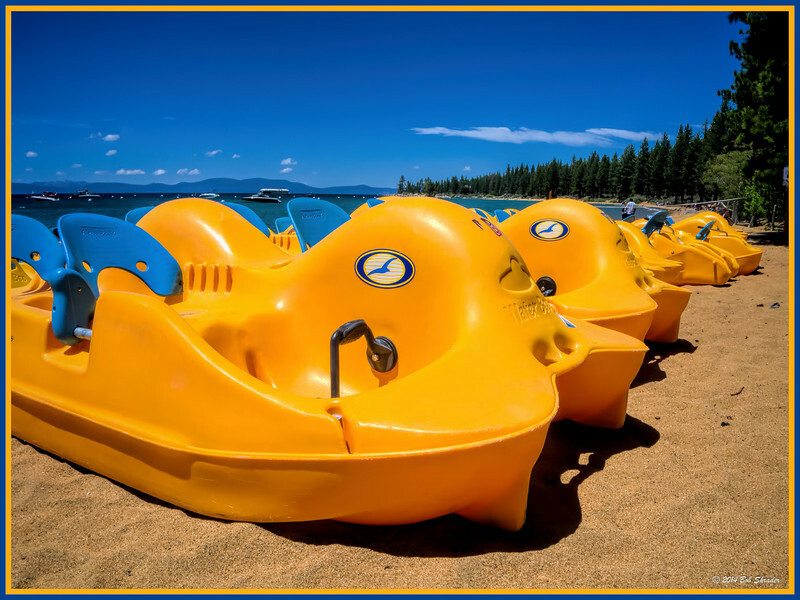 Plastic paddle boats on the sandy shore of Lake Tahoe. Shot with an Olympus OM-D E-M5 m43 camera and Olympus M.Zuiko 12-50 f3.5-6.3 kit lens. Raw conversion in Photo Ninja 1.2.3 via Lightroom 5.3. Post Processing in PhotoLine 18, Topaz photoFXlab, Topaz Adjust 5 and Topaz Clarity. Boat on the Water I. 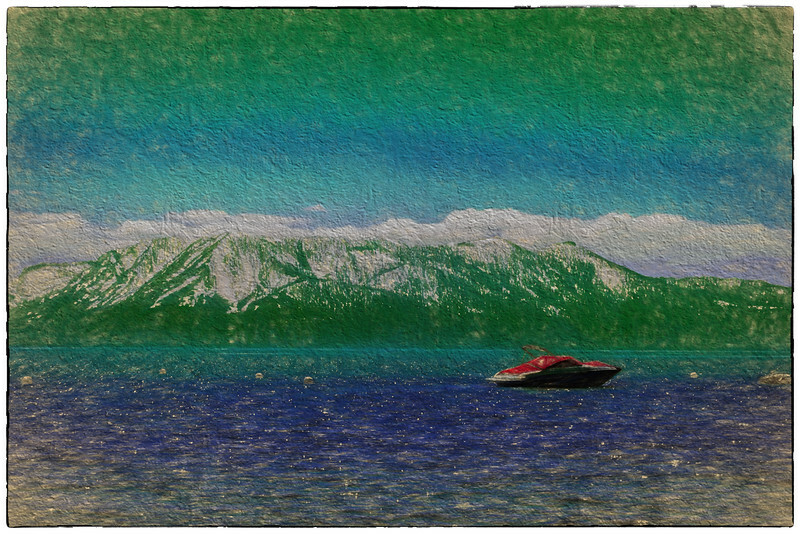 1 of 2 digital art renderings of s boat on Lake Tahoe. From a raw image shot with an Olympus E-620 and M.Zuiko 14-42mm f/5-5.6; conversion in Lightroom 5.6. Post processing in Photoshop CC 2014, Topaz Clarity, Topaz Impression (Cave Dweller I preset) and Google Nik Collection Color Efex Pro 4. 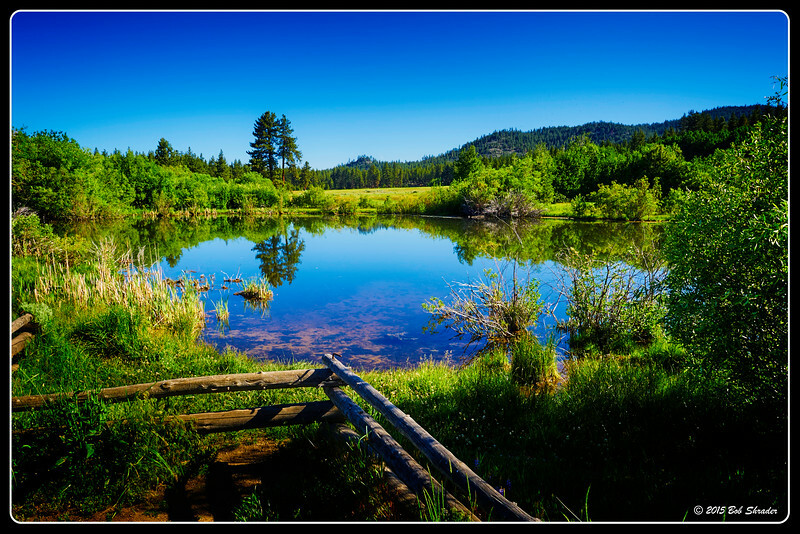 Mountain view of lake. Shot with an Olympus E-M5 and M.Zuiko 12-50mm f/3.5-6.3. Raw conversion and processing in on1 Perfect Photo Suite 9.5. 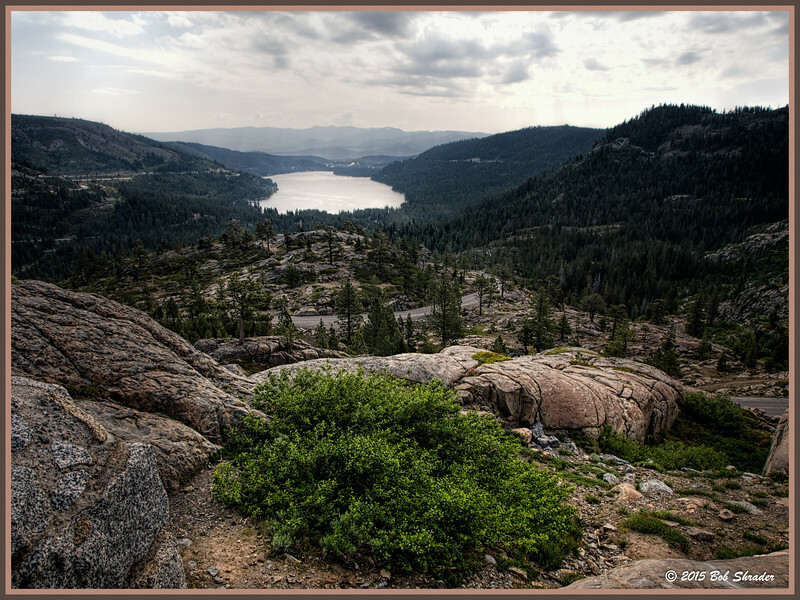 Additional processing in Lightroom 5.7, Photoshop CC 2014, Topaz Clarity, Topaz Detail 3 and Topaz Adjust 5. The Tahoe Queen cruise boat docked on Lake Tahoe. Test of the new version of Photoshop Lightroom -- CC (6) -- conversion and processing an old ORF raw image shot with an Olympus E-M5. 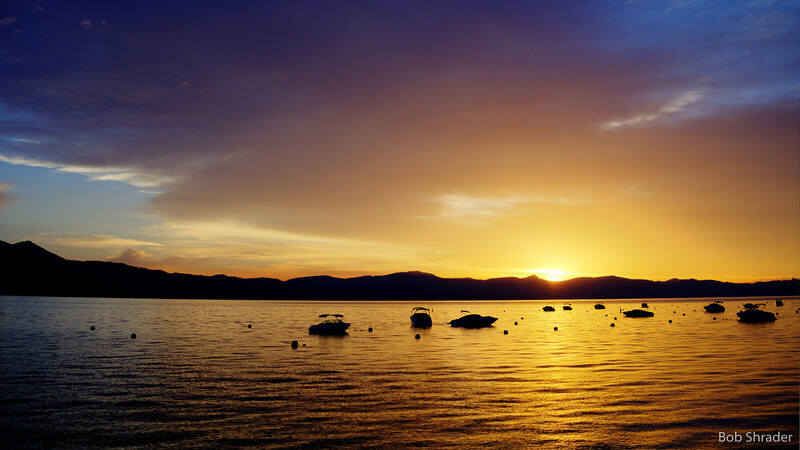 Sunset on Lake Tahoe. A test of Photo Merge - HDR function in the new version of Adobe Lightroom - CC (6). Additional correction can be applied to the resulting DNG file non-destructively. Unlike Photomatix Pro and Google Nik HDR Efex Pro, this function will not work on a single image in Lightroom. However, this test was done with two addtional virtual copies, one at 2 stops over and the other at 2 stops under, thus the three did produce a new DNG copy. Obviously the quality is not the same as what would be achieved with multiple exposures. All processing done in Adobe Lightroom CC 6. 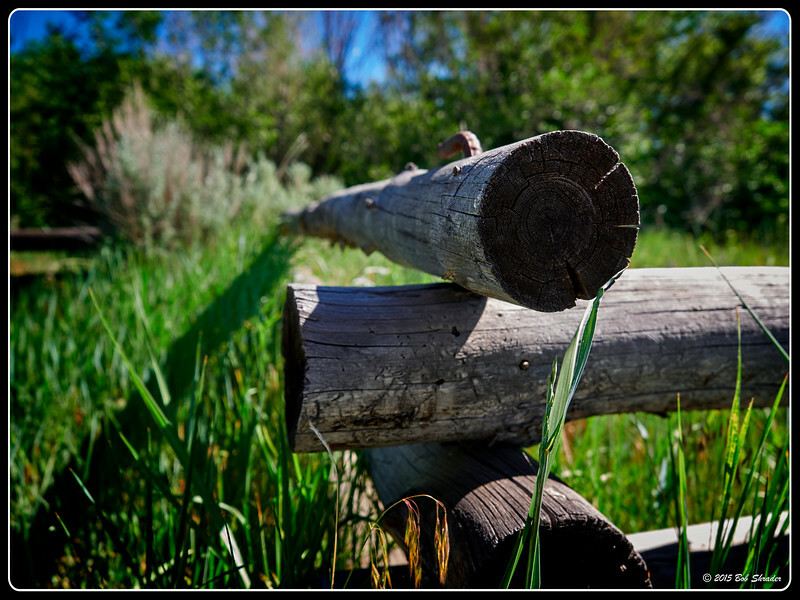 A log fence along the Lam Wa Tah Trail in the Rabe Meadow in Stateline, Nevada. Shot with an Olympus E-M1 and M.Zuiko 12-40mm f/2.8 PRO. Raw conversion in Phase One Capture One Pro 8.3. Post processing in PhotoLine 19 and on1 Perfect Photo Suite 9.5. 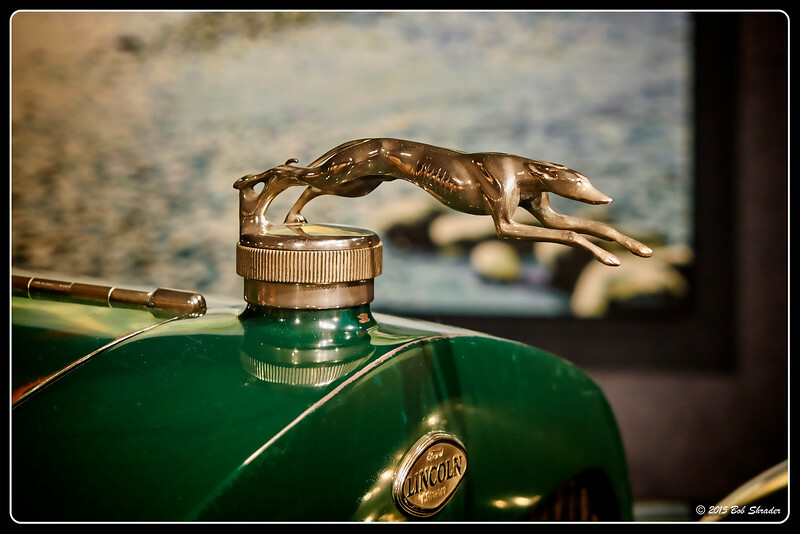 Radiator Cap Ornament on a 1927 Ford Lincoln L-152 5-Passenger Sedan, part of the Harrah Collection at the National Automobile Museum in Reno Nevada. Shot with an Olympus E-M1 and M.Zuiko 12-40mm f/2.8 PRO. Raw conversion wiith Phase One Capture One Pro 8.3. Post processing in PhotoLine 19, Topaz Clean and on1 Perfect Photo Suite 9.5. 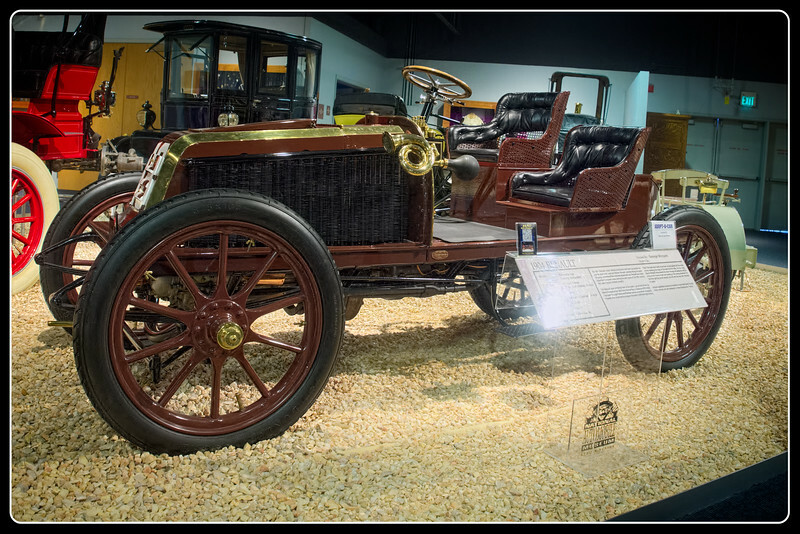 A 1912 International on display at the National Automobile Museum, Reno, Nevada. Shot with an Olympus E-M1 and M.Zuiko 12-40mm f/2.8 PRO. 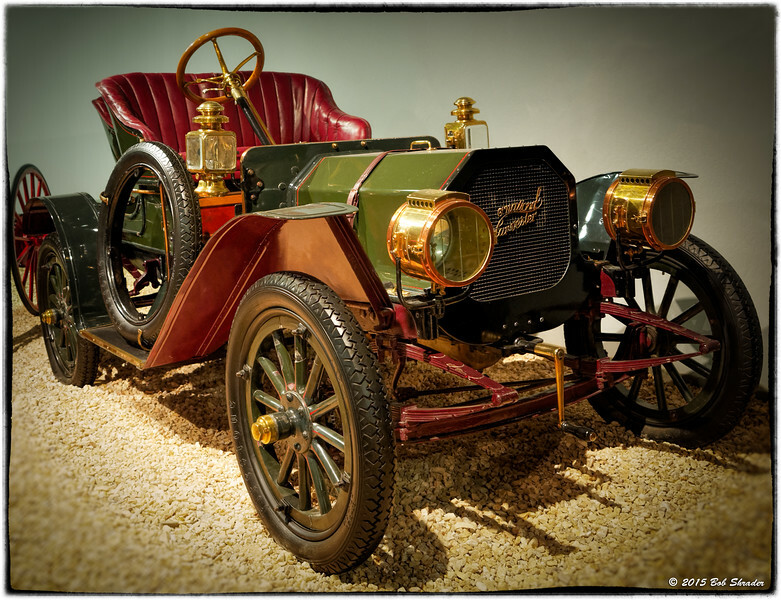 1903 Model "A" Runabout Cadillac, original price $892 USD. National Automobile Museum, Reno, Nevada. Shot with an Olympus E-M1 and M.Zuiko 12-40mm f/2.8 PRO. Raw conversion in PhotoLine 19. Post processing in PhotoLine and Google Nik Collection Color Efex Pro 4. A simulation of antique B&W film. 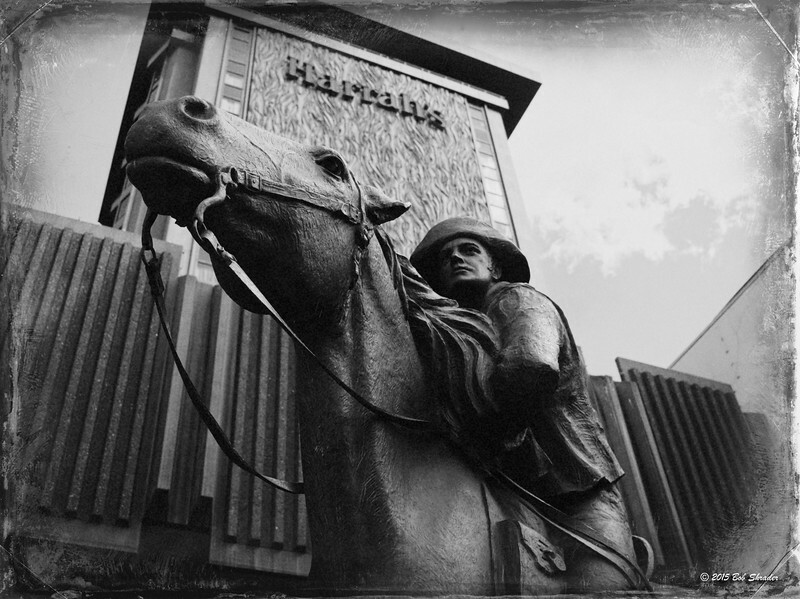 Tribute to the Pony Express in front of Harrah's hotel and casino in Stateline, Nevada. The pony express rider passed this point in 1860 in route to a nearby remount station in Edgewood, Nevada. Shot with an Olympus E-M1 and M.Zuiko 12-40mm f/2.8 PRO. Raw conversion in Phase One Photo Ninja 1.2.5. Post processing in PhotoLine 19 and Alien Skin Exposure 7 (B&W Films - Vintage - Daguerreotype - Damaged). 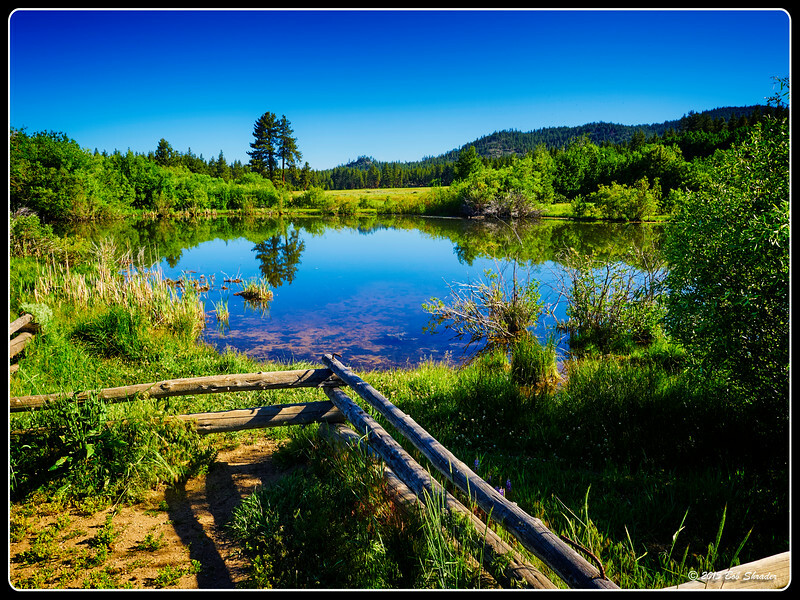 A small pond on the Lam Wa Tah Trail in Rabe Meadow, Stateline, Nevada.. Shot with an Olympus E-M1 and M.Zuiko 12-40mm f/2.8 PRO. Raw conversion in Phase One Capture One Pro 8.3. 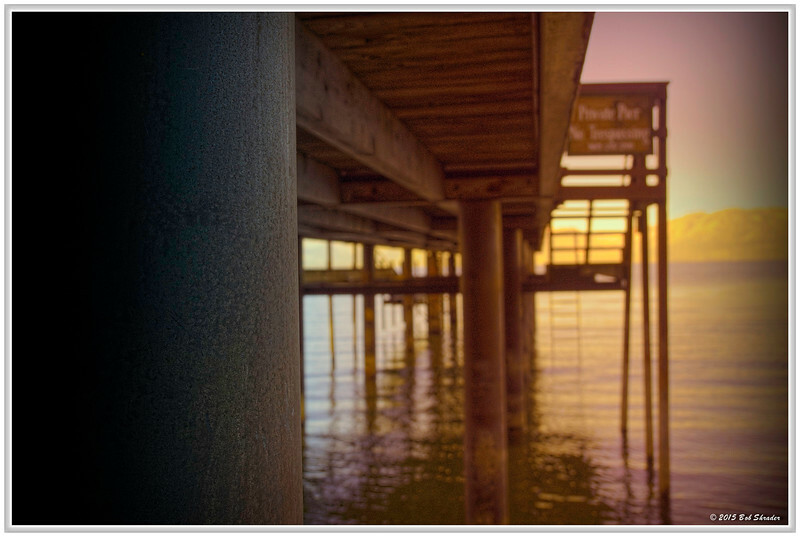 Post processing in PhotoLine 19, Topaz Clarity, and on1 Perfect Photo Suite 9.5. A diffused film look applied to this digital image of a restaurant sign. 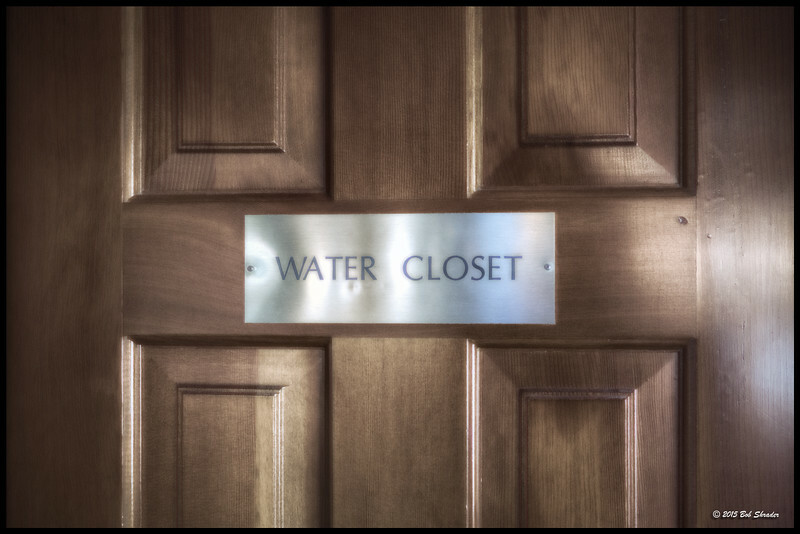 The British euphemism for flush toilet used on this interior door at the Cafe Fiore in what was once a house in South Lake Tahoe, Nevada. Both the unisex restroom and the restaurant are tiny, but the Italian food there is superb. Shot with an Olympus E-M1 and Lumix G 20mm f/1.7. Raw conversion and HDR processing in Google Nik Collection HDR Efex Pro 2 via Lightroom CC 2015. Post processing in PhotoLine 19, Topaz Clarity and Topaz B&W Effects 2. Mule's Ear (Wyethia arizonica) wildflowers in bloom along the trail around Spooner Lake in Spooner Lake State Park, Nevada. Raw HDR conversion in Google Nik Collection HDR Efex Pro 2. Post processing in Lightroom CC 2015, PhotoLine and on1 Perfect Photo Suite. 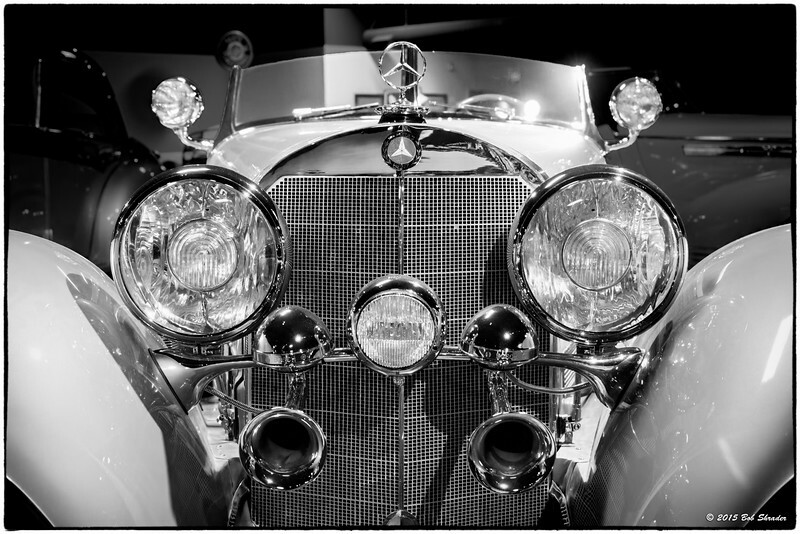 Black and white film effect applied to digital image of the front of a 1938 Mercedes-Benz convertible, featuring a hood ornament with the company's ubiquitous logo. 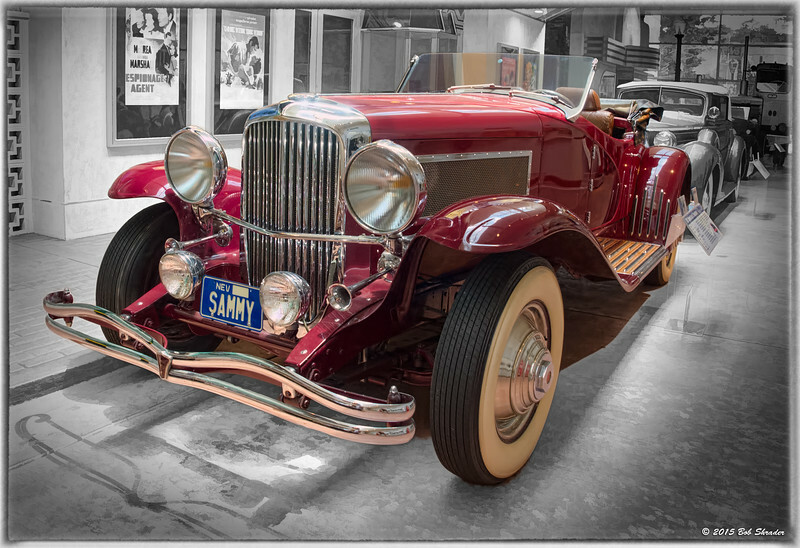 One of the many cars in the National Automobile Museum in Reno, Nevada. Shot with an Olympus E-M1 and M.Zuiko 12-40mm f/2.8 PRO. Raw conversion in PictureCode Photo Ninja 1.2.5 via Lightroom CC 2015. Post processing in Photoshop CC 2015, Topaz Clarity and Topaz B&W Effects 2 (Traditional Collection - Classic). The front of a 1938 Mercedes-Benz convertible, featuring a hood ornament with the company's ubiquitous logo. One of the featured cars in the National Automobile Museum in Reno, Nevada. Olympus E-M1 and M.Zuiko 12-40mm f/2.8 PRO. Raw conversion in PictureCode Photo Ninja 1.2.5 via Lightroom CC 2015. Post processing in Photoshop CC 2015, Topaz Clarity and Topaz Adjust 5. 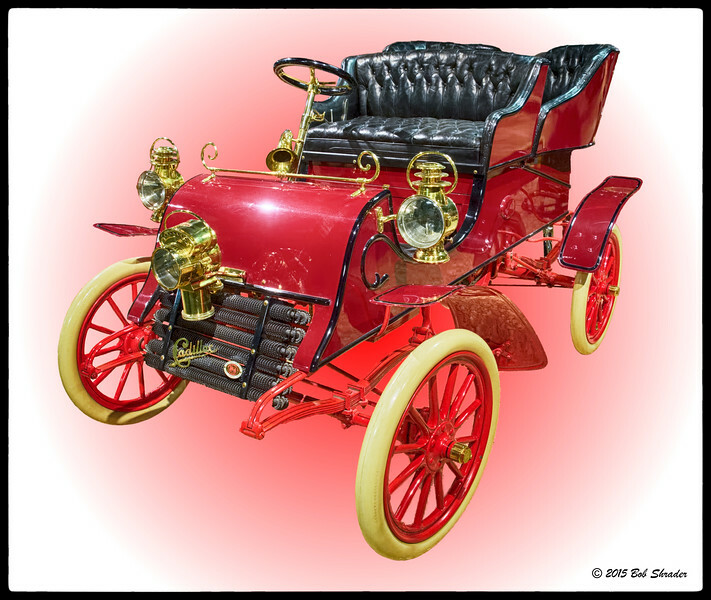 HDR rendering of 1910 International, Model "F" Roadster built by International Harverster, Chicago, Illinois. Priced at $1,000 USD when new. On display at the National Automobile Museum in Reno, Nevada. Olympus E-M1 and M.Zuiko 12-40mm f/2.8 PRO. Raw conversion in DxO Optics Pro 10.4 via Lightroom CC 2015. 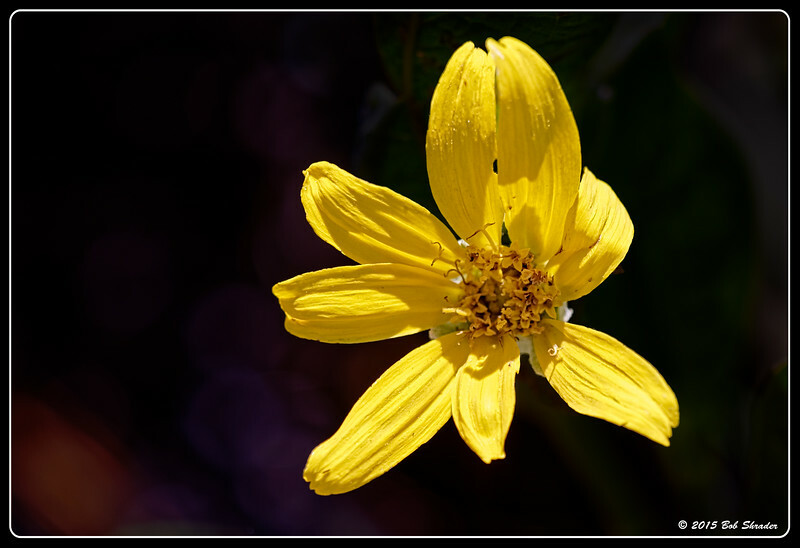 Post processing in Photoshop CC 2015, Topaz Adjust 5 and Google Nik Collection Color Efex Pro 4. 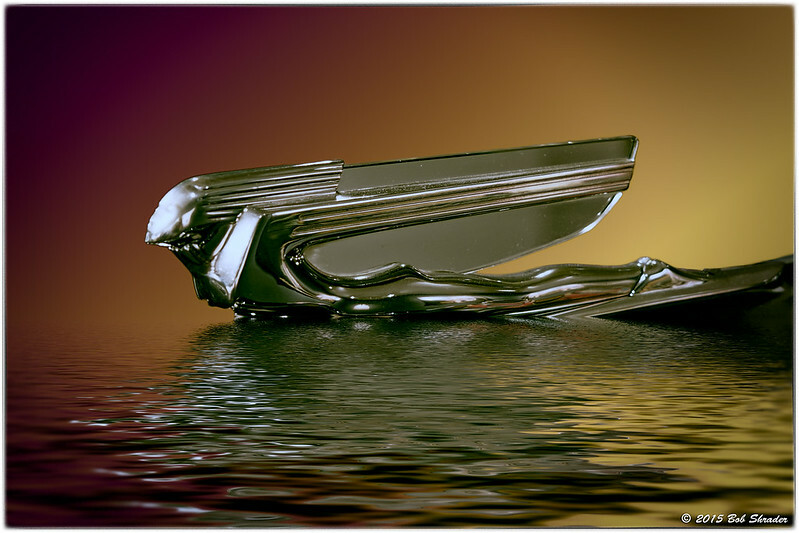 Reflection in water in this stylized rendering of the hood ornament of a 1938 Cadillac Touring Sedan on display at the National Automobile Museum in Reno, Nevada. Olympus E-M1 and M.Zuiko 12-40mm f/2.8 PRO. Raw conversion in DxO Optics Pro 10.4 via Lightroom CC 2015. Post processing in Photoshop CC 2015, Topaz Simplify, Flaming Pear Flood, Alien Skin Exposure 7 and Google Nik Collection Color Efex Pro 4. 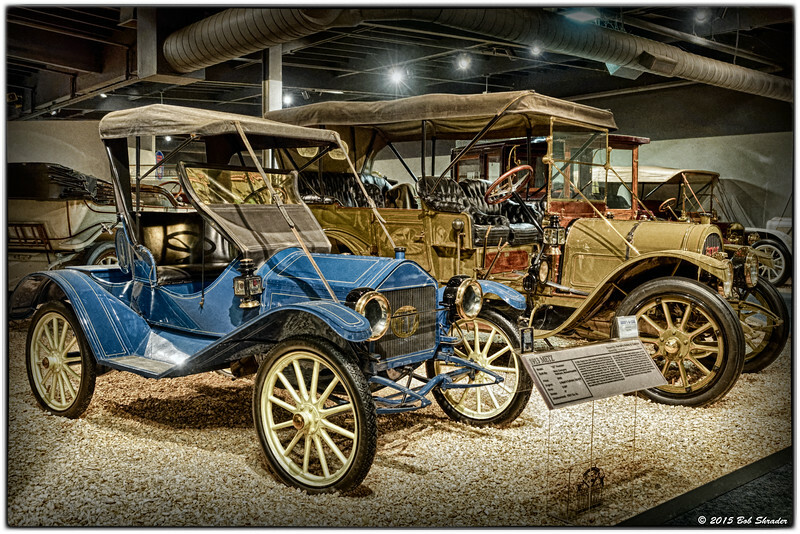 Here at the National Automobile Museum in Reno, Nevada there are many cars to view. In fact, it's a very crowded place -- a challenge for a photographer seeking isolated shots of particular models. In a corner was this 1958 Ford Edsel Citation four-door hardtop, 8-cylinder 345-horsepower, which listed for $3,615 USD. Edsels were produced from 1957 to 1959, a commercial flop for the company but excellent cars, nonetheless. For some of us coming of age during that period, if our family didn't buy one, we knew someone down the block who did. Shot with an Olympus E-M1 and M.Zuiko 12-40mm f/2.8 PRO. Raw conversion in DxO Optics Pro 10.4 via Lightroom CC 2015. 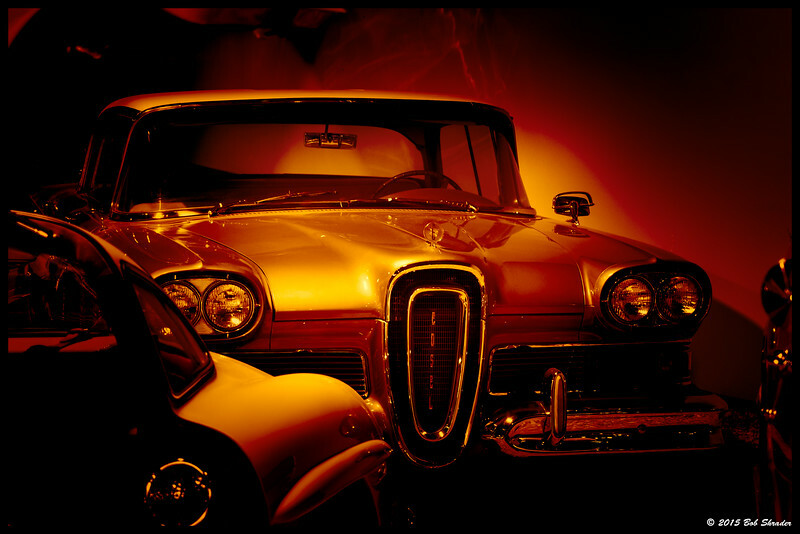 Post processing in Photoshop CC 2015 and Topaz B&W Effects 2 (Stylized Collection: Quadtone Redscale I). Just a fraction of the lineup of classic car models on display at the National Automobile Museum, Reno, Nevada. Olympus E-M1 and M.Zuiko 12-40mm f/2.8 PRO. Raw conversion in DxO Optics Pro 10.4 via Lightroom CC 2015. Post processing in Photoshop CC 2015, Google Nik Collection HDR Efex Pro 2, Topaz Adjust 5 and Color Efex Pro 4. 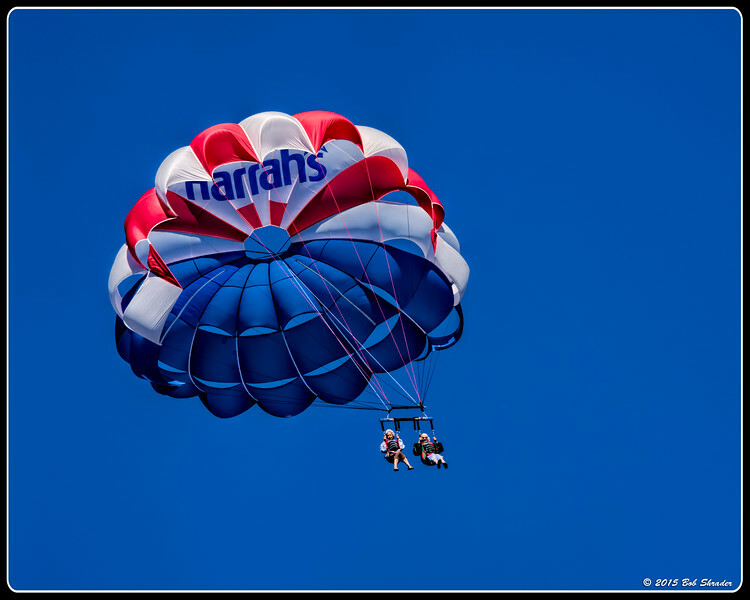 A couple of tourists riding on a parasail pulled by a boat on Lake Tahoe near the California side shore. Olympus E-M1 and M.Zuiko 40-150mm f/2.8 PRO. Raw conversion in PictureCode Photo Ninja 1.2.5 via Lightroom CC 2015. Post processing in Photoshop CC 2015, Topaz Clarity and on1 Perfect Effects Suite 9.5. Headlamp on a 1903 Cadillac. National Automobile Museum, Reno, Nevada. 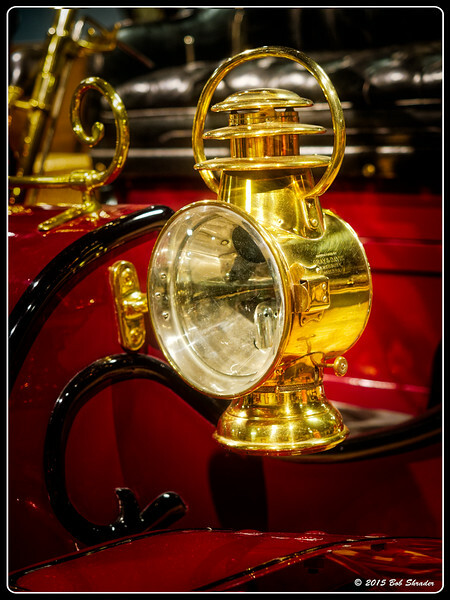 These light devices on early cars were not electrict but burned kerosene. Olympus E-M1 and M.Zuiko 12-40mm f/2.8 PRO. Raw conversion in DxO Optics Pro 10.4 via Lightroom CC 2015. Post processing in Photoshop CC 2015, Topaz Clarity and on1 Perfect Effects 9.5. 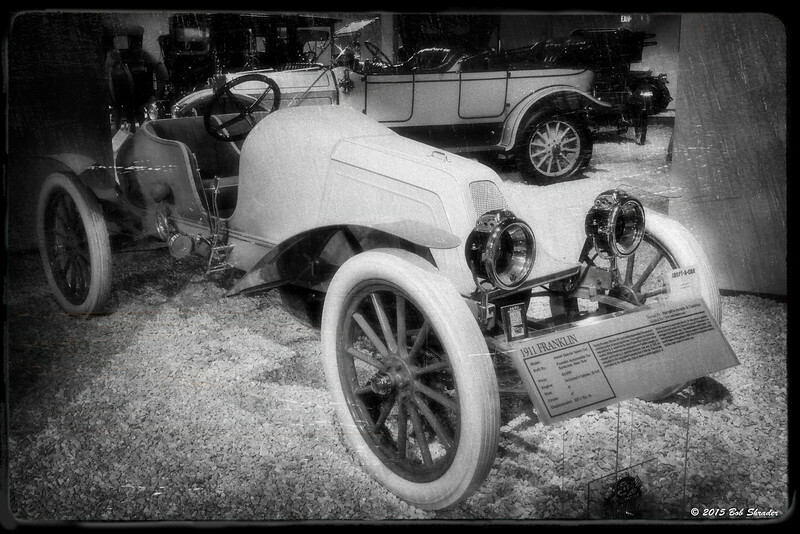 A damaged glass plate B&W simulation of this 1911 Franklin. Model: Averell Special Speed Car. Built by Franklin Automobile Company, Syracuse, New York. Price: $3,000 USD. Air-cooled, 4-cylinder 25-horsepower engine. Franklin built a limited number of special sports cars in 1910 and 1911. National Automobile Museum, Reno, Nevada. Olympus E-M1 and M.Zuiko 12-40mm f/2.8 PRO. Raw conversion in DxO Optics Pro 10.4 via Lightroom CC 2015. Post processing in Photoshop CC 2015, on1 Perfect Effects Suite 9.5 and DxO FilmPack 5. The sign atop a 1936 De Soto De Lux Airstream Taxicab, one of a fleet of 2,200 ordered by a New York taxicab company, the largest single order of the model up to that time. 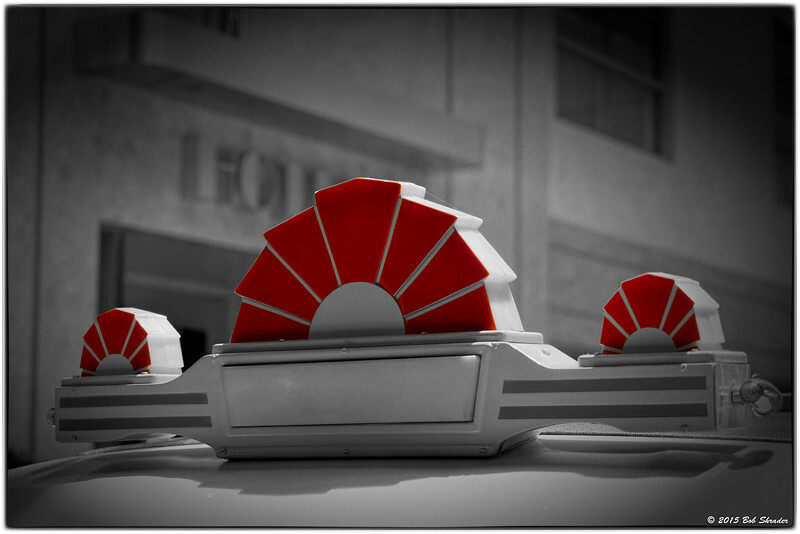 These cabs were equipped with radios and sliding roofs, the first use of sliding roofs in vehicles in this country. National Automobile Museum, Reno Nevada. Shot with an Olympus E-M1 and M.Zuiko 12-40mm f/2.8 PRO. Raw conversion in PictureCode Photo Ninja 1.2.5 via Lightroom CC 2015. 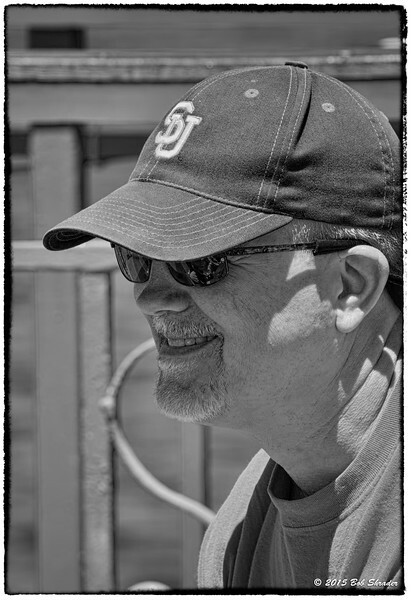 Post processing in Photoshop CC 2015, Topaz Clarity, on1 Perfect B&W Suite 9.5 and Google NIk Color Efex Pro 4. 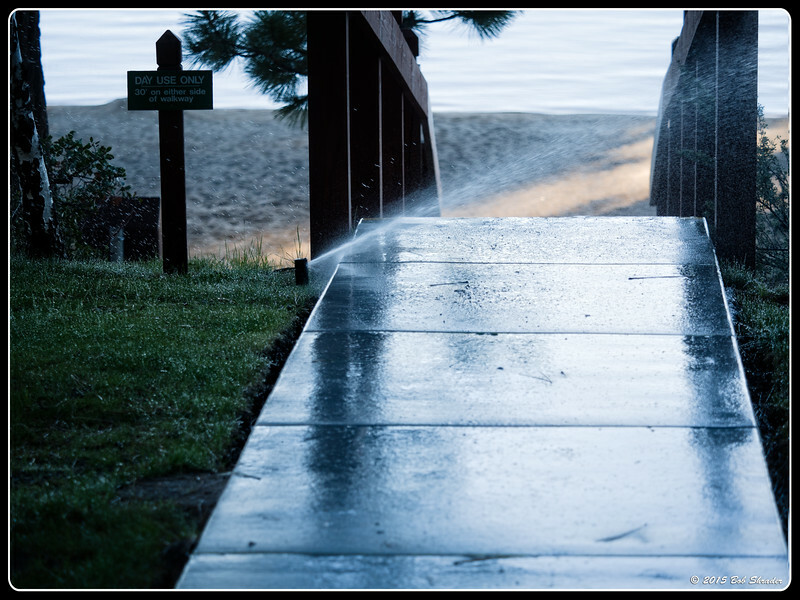 Here on the eastern shore of Lake Tahoe in the state of Nevada -- in the middle of a serious drought -- property owners are wasting a precious resource by watering the grass and the sidewalk every day. 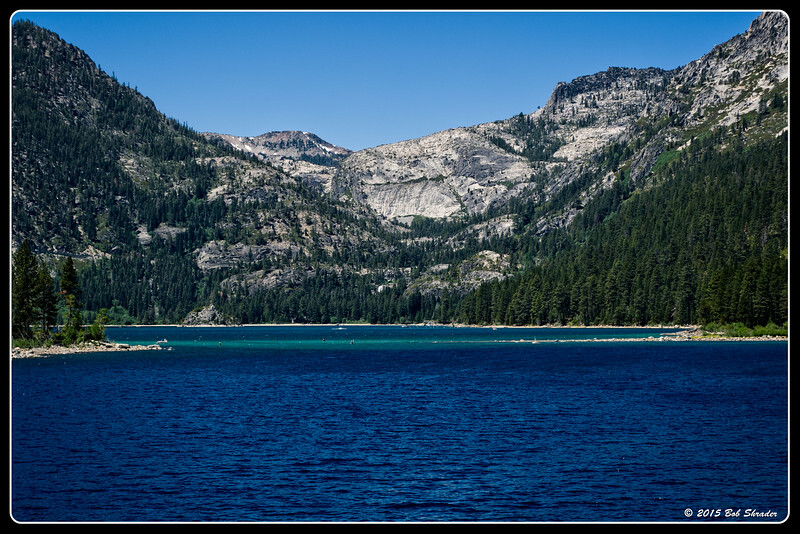 While on the western side of the lake in California, the state has enacted severe restrictions to conserve water, including prohibition of watering yards. Olympus E-M1 and M.Zuiko 40-150mm f/2.8 PRO. Raw conversion in Phase One Capture One Pro 8.3 via Lightroom CC 2015. Post processing in Photoshop CC 2015 and on1 Perfect Effects Suite 9.5. 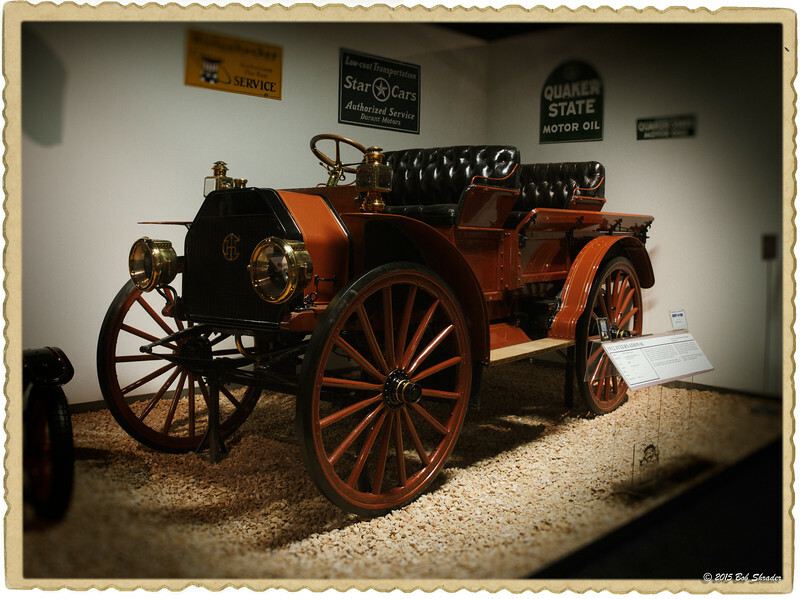 1904 Renault, one of many antique automobiles on display at the National Automobile Museum in Reno, Nevada. Olympus E-M1 and M.Zuiko 12-40mm f/2.8 PRO. Raw conversion in PictureCode Photo Ninja 1.2.5 via Lightroom CC 2015. Post processing in Photoshop CC 2015 and on1 Perfect Effects Suite 9.5. 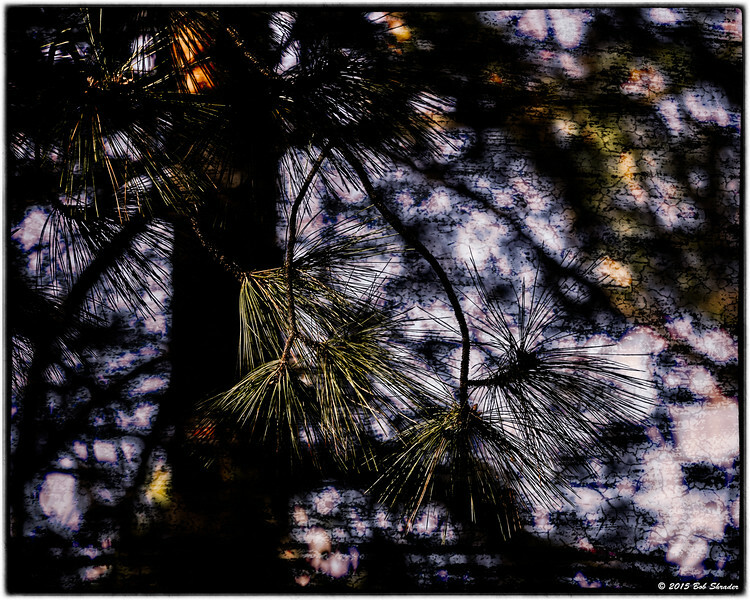 Texture applied to an image of pine tree branches in Zephyr Cove, Nevada on Lake Tahoe. Olympus E-M1 and M.Zuiko 12-40mm f/2.8 PRO. Raw conversion in Phase One Capture One Pro 8.3 via Lightroom CC 2015. Post processing in Photoshop CC 2015, on1 Perfect Layers 9.5 and Google Nik Collection Color Efex Pro 4. 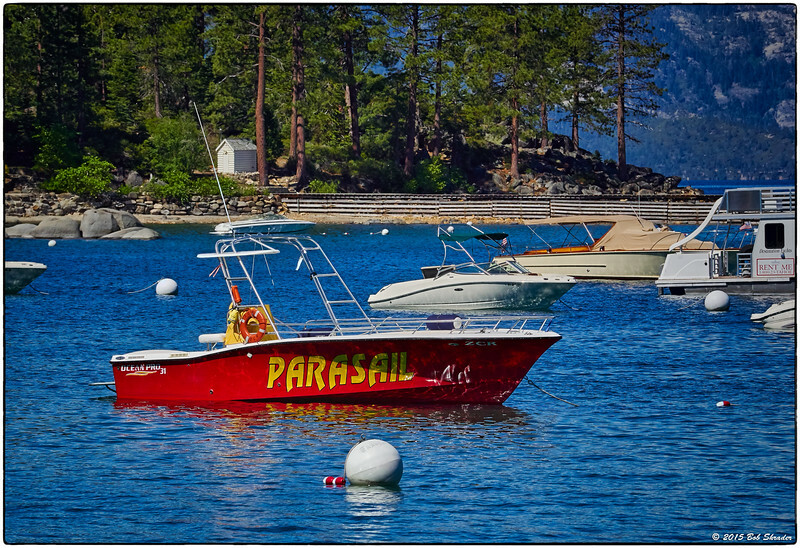 Boats on the eastern shore of Lake Tahoe, Nevada just needing some sailers on this sunny day. In my belief creative photography only begins with the camera, and amateur photographers should share information: Shot with an Olympus E-M1 and M.Zuiko 40-150mm f/2.8 PRO; raw conversion in Phase One Capture One Pro 8.3 via Lightroom CC 2015; post processing in Photoshop CC 2015, Topaz Clarity, Alien Skin Exposure 7 and Google Nik Color Efex Pro 4. 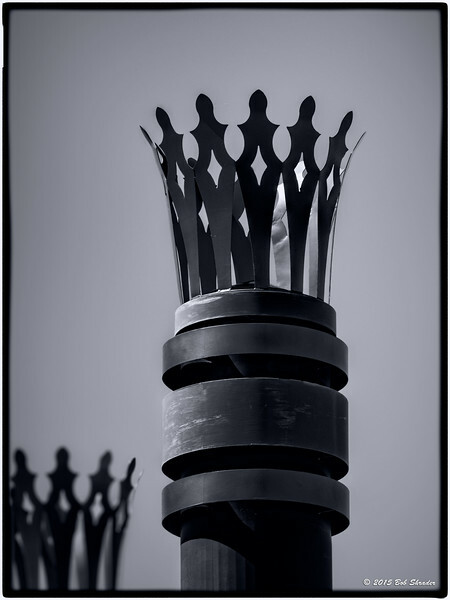 Decorative trim on the smokestacks of the M.S. Dixie II, carrying diesel engine fumes away from boat and passengers. In my belief creative photography only begins with the camera, and amateur photographers should share information: Shot with an Olympus E-M1 and M.Zuiko 40-150mm f/2.8 PRO; raw conversion in DxO Optics Pro 10.4 via Lightroom CC 2015; post processing in Photoshop CC 2015, Topaz Clarity, Alien Skin Exposure 7 and Topaz B&W Effects 2 (Gold Blue II with blue filter). 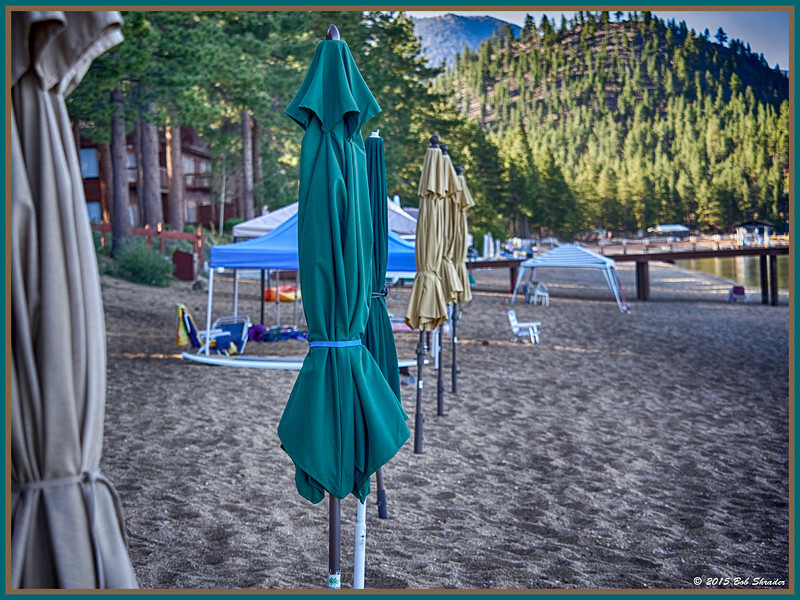 A very shallow depth of field in this shot where It's too early in the morning for people to be enjoying this beachfront for the Pinewild Condominiums on Lake Tahoe in Zephyr Cove, Nevada. In my belief creative photography only begins with the camera, and amateur photographers should share information: Olympus E-M1 and M.Zuiko 40-150mm f/2.8 PRO. Raw conversion in Phase One Capture One Pro 8.3 via Lightroom CC 2015. Post processing in Photoshop CC 2015, Google Nik Collection HDR Efex Pro 2 and Topaz Adjust 5. 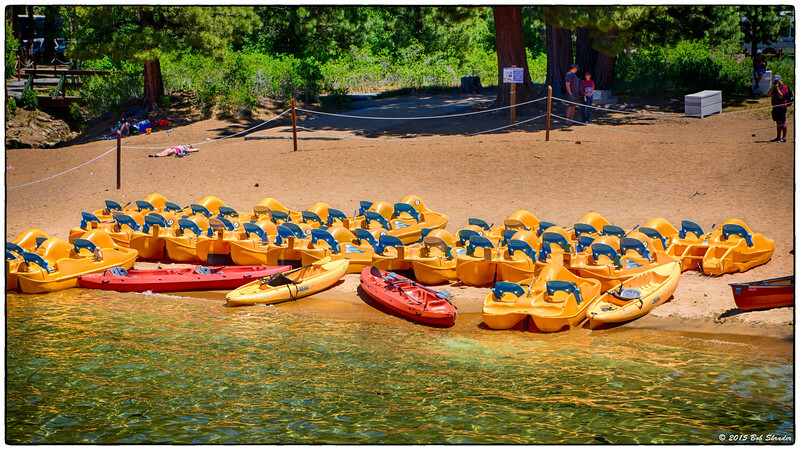 A fleet of colorful plastic boats for rental to vacationers at a Zephyr Cove, Nevada recreation area on Lake Tahoe. In my belief creative photography only begins with the camera, and amateur photographers should share information: Shot with an Olympus O-M1 and M.Zuiko 40-150mm f/2.8 PRO; raw conversion in Lightroom CC 2015 (ACR); HDR processing in Google Nik Collection HDR Efex Pro 2; other post processing in Photoshop CC 2015. Topaz Clarity and Color Efex Pro 5. A replica of a 1935 Duesenberg, model SSJ. This vehicle was built in 1971 during a time when it was trendy to own a replica car. The originals in the 1920s and 1930s were extremely expensive, afforded by only the extremely rich. This replica has a V-8, 504 HP engine and sold for $29,000 USD when new. It was owned by entertainer Sammy Davis, Jr. In my belief creative photography only begins with the camera, and amateur photographers should share information: Shot with An Olympus E-M1 and M.Zuiko 12-40mm f/2.8 PRO. Raw conversion in PictureCode Photo Ninja 1.2.5 via Lightroom CC 2015. Post processing in Photoshop CC 2015, Topaz Adjust 5, Topaz B&W Effects 2 (Stylized Collection: Cartoon), Alien Skin Exposure 7 and Google Nik Collection Color Efex Pro 4. 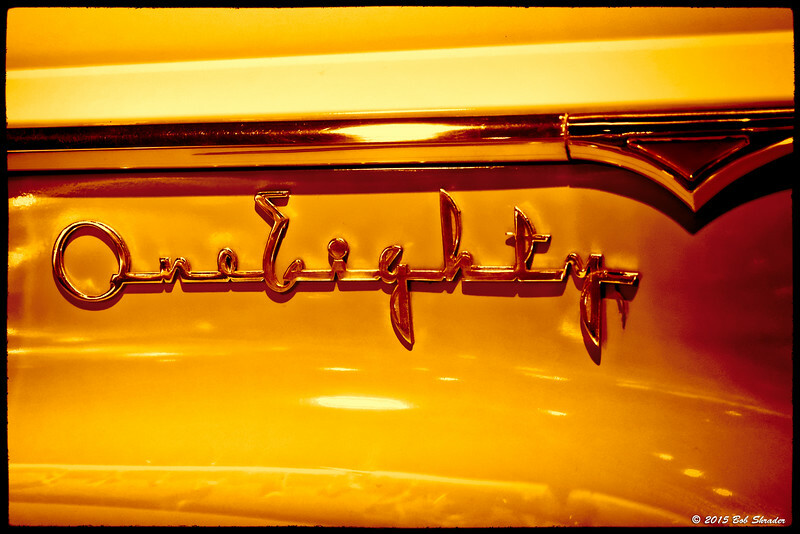 FIlm effect applied to model side-logo for a 1942 Packard 180 at the National Automobile Museum, Reno Nevada. In my belief creative photography only begins with the camera, and amateur photographers should share information: Shot with an Olympus E-M1 and M.Zuiko 12-40mm f/2.8 PRO: Raw conversion in DxO Optics Pro 10.4 via Lightroom CC 2015; Post processing in Photoshop CC 2015, Topaz Adjust 5 and Topaz B&W Effects 2 (Quad Tone Red Scale I Dynamic). 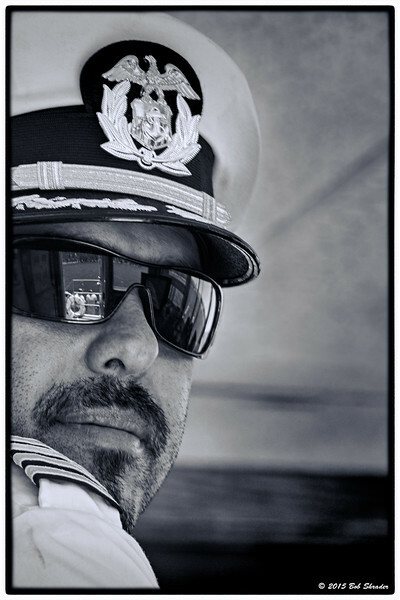 Black and white film effect applied to digital rendering of the captain on the bridge of the Tahoe Queen embarking for a cruise to Emerald Bay on Lake Tahoe. In my belief creative photography only begins with the camera, and amateur photographers should share information: Shot with an Olympus E-M1 and M.Zuiko 12-40mm f/2.8 PRO; Raw conversion in Phase One Capture One Pro 8.3 via Lightroom CC 2015; Post processing in Photoshop CC 2015, Topaz Adjust 5 and Topaz B&W Effects 2 (Cool Tone II). The entrance to Emerald Bay from Lake Tahoe, California. In my belief creative photography only begins with the camera, and amateur photographers can learn from one another and should share information: Shot with an Olympus E-M1 and M.Zuiko 40-150mm f/2.8 PRO; Raw conversion in Lightroom CC 2015 (ACR) and HDR processing in Google Nik HDR Efex Pro 2; Post processing in Photoshop CC 2015 and on1 Perfect Effects Suite 9.5. 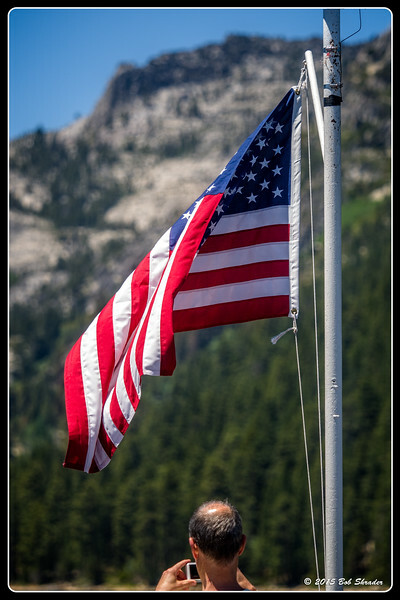 Standing on deck beneath the American flag, a tourist snaps a picture of the mountain with his smartphone as the Tahoe Queen nears the shore in Emerald Bay on Lake Tahoe, California. In my belief creative photography only begins with the camera, and amateur photographers should learn from one another and share information: Shot with an Olympus E-M1 and M.Zuiko 12-40mm f/2.8 PRO; Raw conversion in Lightroom CC 2015 (ACR); post processing in Photoshop CC 2015 and on1 Perfect Effects 9.5 (Color Pop - Subtle Sunshine preset). 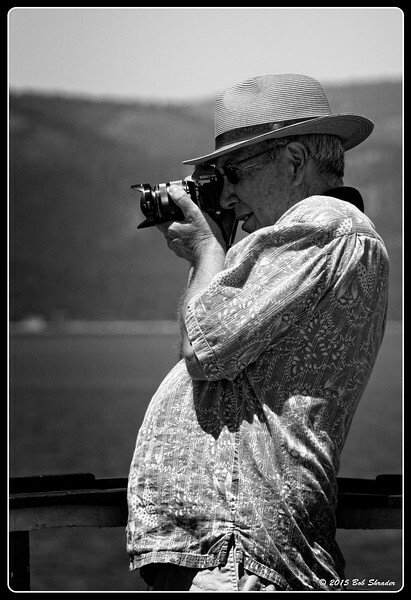 Black and white film effect applied to a tourist aboard the Tahoe Queen on Lake Tahoe gets a shot with his Olympus E-M1 and M.Zuiko 12-40mm f/2.8 PRO near the shore in Emerald Bay. In my belief creative photography only begins with the camera, and amateur photographers should learn from one another and share information: Shot with an Olympus E-M1 and M.Zuiko 40-150mm F/2.8 PRO; Raw conversion in PictureCode Photo Ninja 1.2.5 via Lightroom CC 2015; Post processing in Photoshop CC 2015 and on1 Perfect Effects Suite 9.5 (B&W - Kodak Tri-X 400). 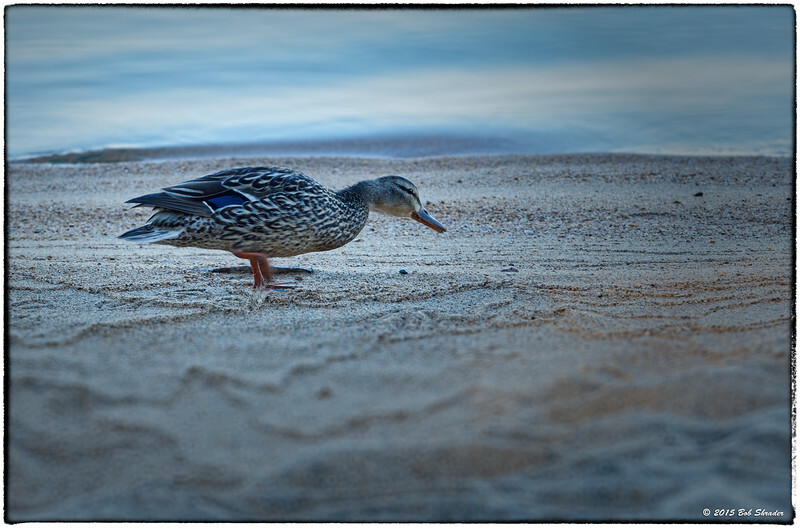 A duck looks for food tourists may have discarded on the Lake Tahoe beach in Zephyr Cove, Nevada. In my belief creative photography only begins with the camera, and amateur photographers can learn from one another and should share information: Shot with an Olympus E-M1 and M.Zuiko 40-150mm f/2.8 PRO; raw conversion in DxO Optics Pro 10.4 via Lightroom CC 2015; post processing in Photoshop CC 2015, Topaz Adjust 5, Topaz Lens Effects and Google Nik Color Efex Pro 4. 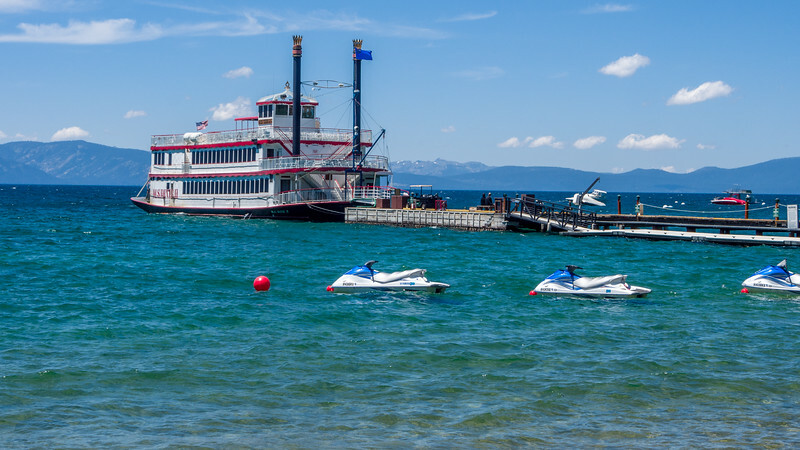 A tourists aboard the Tahoe Queen enjoying the Lake Tahoe round trip from Zephyr Cove on the Nevada side to Emerald Bay on the California side of the lake. In my belief creative photography only begins with the camera, and amateur photographers can learn from one another and should share information: Shot with an Olympus E-M1 and M.Zuiko 40-150mm f/2.8 PRO; raw conversion in PictureCode Photo Ninja 1.2.5 via Lightroom CC 2015; post processing in Photoshop CC 2015, Topaz Adjust 5 and Google Nik Silver Efex Pro 2. 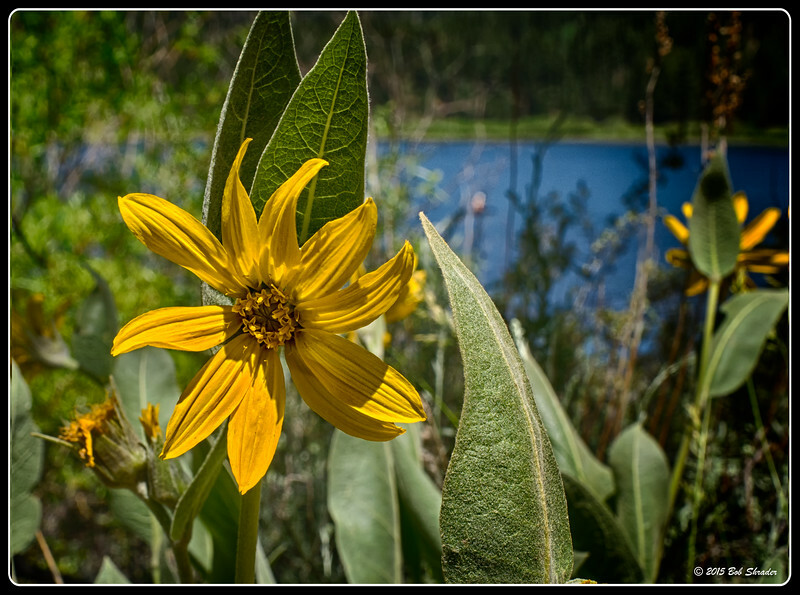 The bright yellow of a Wyethia arizonica wildflower along the trail at Spooner Lake State Park, near Lake Tahoe, Nevada. In my belief creative photography only begins with the camera, and amateur photographers can learn from one another and should share information: Shot with an Olympus E-M1 and M.Zuiko 40-150mm f/2.8 PRO; raw conversion in DxO Optics Pro 10.4 via Lightroom CC 2015; post processing in Photoshop CC 2015 and on1 Perfect Photo Effects Suite 9.5. 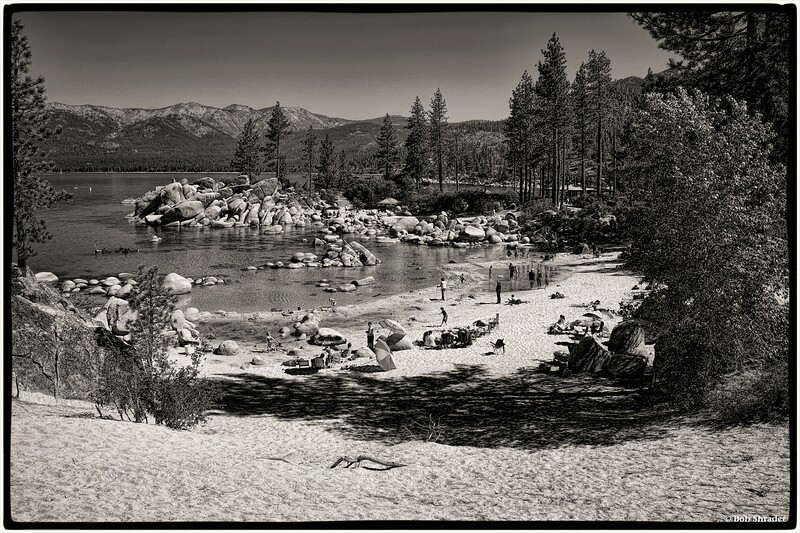 Split tone effect applied to shot of the underbelly of a small private pier on the eastern shore of Lake Tahoe, Nevada. Shot with an Olympus E-M1 and M.Zuiko 12-40mm f/2.8 Pro. Raw conversion in PictureCode Photo Ninja 1.2.6. Post processing in ACDSee Ultimate 9 and Topaz ReStyle (Fiery Orange Preset). 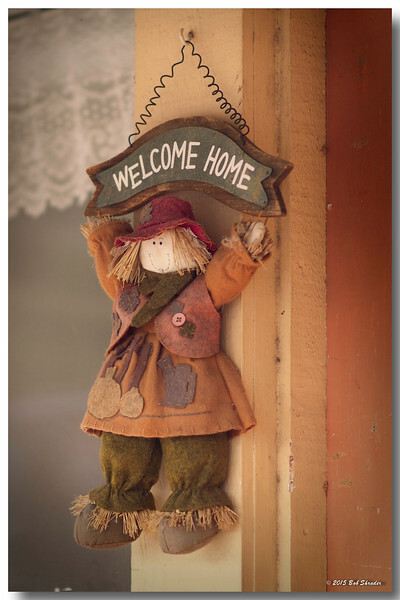 Welcome Home folk art doll and sign outside an antique store in downtown Baird, Callahan County, Texas. Raw conversion and post processing in ACDSee Ultimate 9. Additional post processing in PhotoLine 19, Topaz Adjust 5 (Retro Style IV) and Alien Skin Exposure 7. Stylized rendering of a dock on the shoreline of Emerld Bay used for the boat access to Vikingsholm State Park, California. 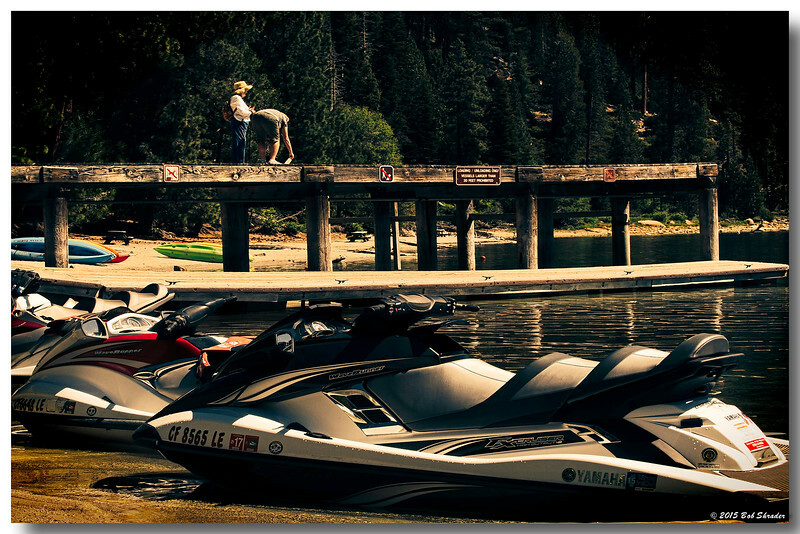 Many visitors come by jetski. Shot with an Olympus E-M1 and M.Zuiko 40-150mm f2.8 PRO. Raw conversion and post processing in ACDSee Ultimate 9 (Transfer Photo Effect). 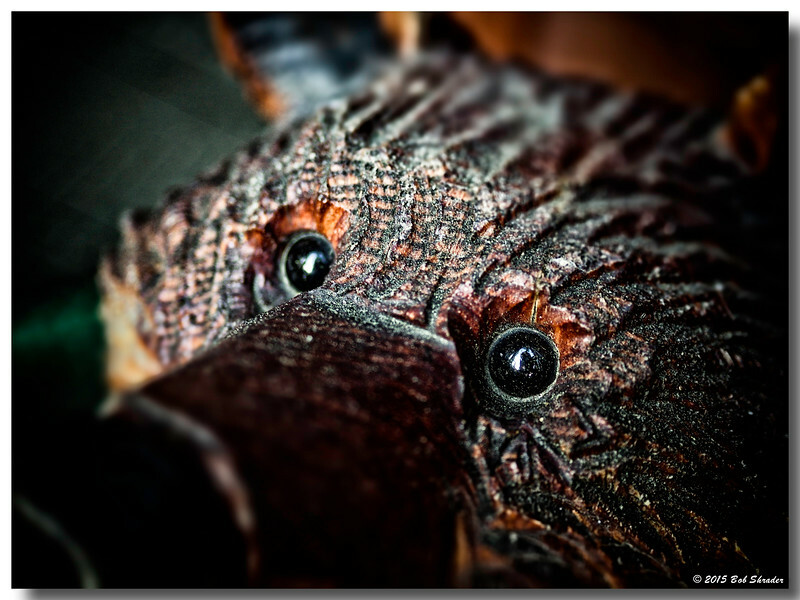 A shallow depth of field applied to this closeup of the head of a bear carved of wood. 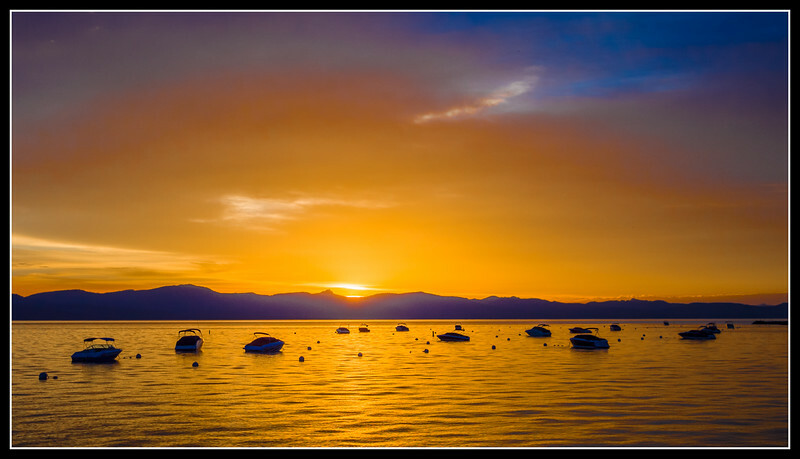 Zephyr Cove, Nevada at Lake Tahoe. Shot with an Olympus E-M1 and Lumix G 20mm f1.7. Raw conversion in ACDSee Ultimate 9. Post processing in PhotoLine 19, Google Nik Color Efex Pro 4 (Bleach Bypass) and ACDSee. 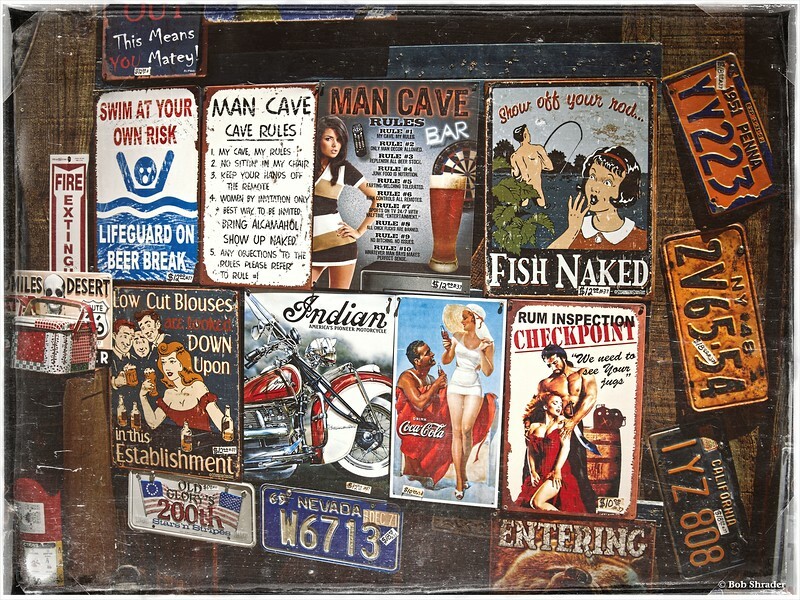 Grunge rendering of a retail display on the main street of Virginia City, Nevada. Raw conversion in DxO Optics Pro 10. Post processing in Topaz photoFXlab, Topaz Adjust 5, Topaz Detail 3, PhotoLine 19 and Alien Skin Exposure X. 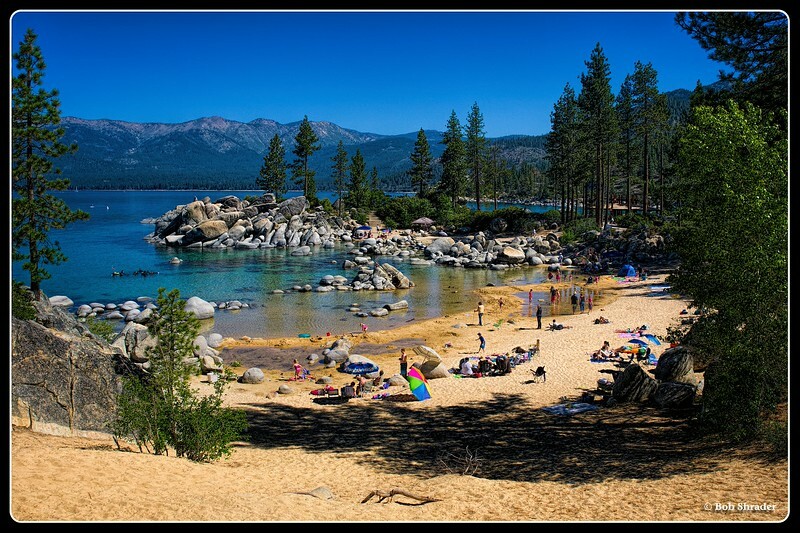 Visitors enjoy a sunny day at a sandy beach in Sand Harbor State Park, Nevada located on Lake Tahoe. Shot with an Olympus E-M1 and M.Zuiko 12-40mm F2.8 PRO. Raw conversion in PictureCode Photo Ninja. Post processing in PhotoLine 19, Topaz Clarity and ON1 Photo 10.